"...received countless favourable comments and compliments about the show. It was the highlight of our weekend and we will never forget the look on the children's faces." "I just want to thank you for the great show you did on my daughter's Bday!!!" "I am just writing you to let you know how satisfied the Lamont Public Library was with your show on Dec. 6, 2008. The audience commented once you had left what a magnificent performance you put on. I noticed how you kept the children engaged in the show allowing them to participate by helping out or just answering questions. They truly felt a part of your show!" "...magic camp from Nov 1. The kids are still raving about it and practicing their skills on family members and friends. 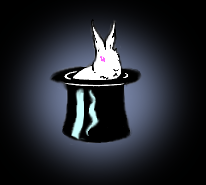 Also, you had such an impression on my daughter... she has decided to do her 4H speech this year on the 'history of magic'." "Thank you for your very enjoyable and fun Magician's performance. My little grandson... had only good remarks after the show and at home that evening." "The magic show for Sam's party was great! Henry you have a wonderful rapport with the kids and you are very aware of all that is happening around you. You kept the roomful of boys' attention focussed. I will totally recommend your show." "We were very impressed with how well you kept the children engaged. We will definitely recommend you... Alexys says "he was awesome". Thanks for also being so attentive to our special needs people. They loved you!" "Feedback from the staff as well as the children... was very positive. The children were entertained for the entire performance. Everyone could see, as well as hear the show well. The children were talking about how they were able to help you all afternoon." "The packed room of children with parents and grandparents, watched with interest and amazement at the tricks. ...children had a chance to participate... a delight for mom's and dad's watching their own child participate." "...thanks and appreciation for performing at our Junior Olympics. The positive feedback from the parents and the smiles of the children were a wonderful response to your Miles of Magic™ shows. ...very professional and well organized. The magic shows were enjoyed by all ages. I would highly recommend your services..."
"...everything went exceptionally well. You were able to communicate with the boys on their level... reaction and that of the other leaders speaks to how successful the show was... good assortment of tricks well organized which made for a very entertaining show." "Our students really enjoyed your magical show. I like the way you involved many of the students in your act. The students talked about it throughout the week..."
"My students loved your presentation. They are a very challenging group and it takes quite a bit to hold their attention. ...kept the children interested and enthralled." "On behalf of myself, the unit staff, and the boys, I would like to thank you for your performance at the Edmonton Young Offenders Centre, Mikkwa Unit. ...enjoyed your performance very much ...appropriate to the chosen age group. The unit staff also provided positive feedback stating that the performance was quite entertaining and your ability to hold the boys attention was excellent." "...thank you for putting on a great show for the children at our Annual Children�s Christmas party... everyone was pleased."